The French call it "l'esprit d'escalier," stairway wit. The witty thing you should have said that occurs to you only as you descend the stairs at the end of the evening. As a novelist, I find that I have staircase thoughts about each of my books, starting with my first novel, published in 1995. Last week I spoke at the wonderful Washington bookstore, Politics & Prose, to an enthusiastic and attentive audience, about True Confections. After my talk and reading, which included the playing the jingle from the counterfeit 1960 commercial for Little Sammies (see http://www.zipscandies.com/), well into the q & a, a woman raised her hand, declared her enjoyment of the book, and then asked me, "How does the Ziplinsky family feel about the book? Have you heard from any of them? I was a little stunned, and I asked her to clarify her question, which she restated firmly. Have I heard from members of the Ziplinsky family? What did they think of the novel? I talked about the very literal response to my previous novel, Triangle, which has led to numerous inquiries from scholars seeking the original documents I quote from throughout the novel (they're all fictional). I explained why this inspired me to create the website for the fictional candy company in this novel. And then I told her very carefully, with a smile, that the fictional characters in my novel, a work of fiction, these imaginary people who run an imaginary candy company, are, no doubt, very angry with me. And everyone laughed, but not, at this point, directly at my questioner. The l'esprit d'escalier thought for that moment, which occurred to me an hour later when I was having dinner with old friends, was to go straight to the big laugh, and for a moment I wished I had responded to her question by saying, "Oh, bad subject! The Ziplinskys are totally furious, and they're suing me for huge damages. It's an utter nightmare. My attorney won't allow me to talk about it." If I had gone for that bigger laugh, which would have been at her expense, I like to think my esprit'descalier at dinner would have been one of regret that I hadn't been kinder. Sometimes people get so caught up in their own vision of a product in development that they forget to take a step back and see how it might, at a glance, strike the casual passerby. 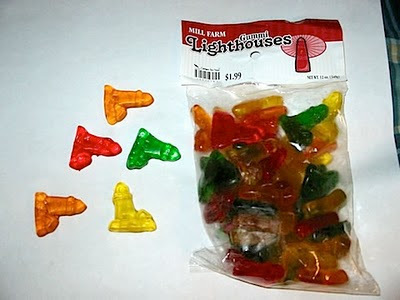 Presumably, that is what happened when the naive people at Mill Farm, possessed of a strange belief that gummy candy in the shape of a lighthouse would be a worthwhile innovation, set about creating this product. Never once did they waver from their goal. Never once did they turn the product on its side.